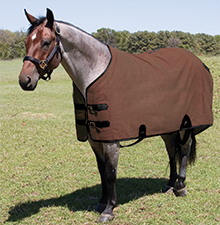 The Mustang Canvas Stable blanket is constructed from 18 ounce water repellent duck canvas with a warm polar fleece liner for added protection and comfort. Two adjustable buckle closures on the contoured open front allow for easy on and off. The contoured shoulders and back ensure a better fit and minimal slippage. Belly and leg straps are made from soft, durable nylon webbing that is double reinforced at wear points for strength and longer wearing blanket.